Prince William and Kate Middleton will be getting a little taste of Hollywood during their upcoming royal trip to Sweden later this month. New reports indicate that the Duke and Duchess of Cambridge are expected to attend a black tie gala with Academy Award winner Alicia Vikander. The Swedish actress won an Oscar back in 2016 for her role in the highly acclaimed film The Danish Girl. As many royal observers know, if there’s one thing that Kate Middleton loves, it’s rubbing elbows with the Hollywood elite. As a matter of fact, she almost never says no to a red carpet event. Plus, there’s no denying that Alicia Vikander is a huge star in the entertainment world. She’s won an Oscar and she is about to appear in the highly anticipated Tomb Raider reboot. Alicia also secretly married actor Michael Fassbender in Ibiza last year. A lot of critics would agree that Alicia is fast becoming one of the biggest stars in the celebrity world right now. In other words, Alicia Vikander is no Meghan Markle. Plus, she’s also got an A-lister like Michael Fassbender by her side. It’s without a doubt that Kate Middleton will try and get as many photos as she can with Alicia and Michael during her visit to Sweden. Of course, that’s not to say that Kate is looking to rub this black tie gala in Meghan’s face. But at the same time Kate’s body language won’t be able to hide the truth: she’ll definitely looks more enthusiastic during her meeting with Alicia Vikander and Michael Fassbender than she was during her Christmas morning stroll with Prince Harry and Meghan Markle. During the event, which will be held at the Residence of the British Ambassador in Sweden, William and Kate will also meet Swedish actor, Stellan Skarsgard along with Crown Princess Victoria and her husband, Prince Daniel. It’s without a doubt that Kate Middleton will have plenty to talk about with Princess Victoria, as the two royals both have children that are similar in age. Unfortunately, both Prince George and Princess Charlotte won’t be in attendance, as they are both currently in school. The Duke and Duchess of Cambridge will head to Norway after completing their tour of Sweden. In the meantime, don’t forget to check back with CDL for all the latest news on Prince William and Kate Middleton along with the entire royal family right here. 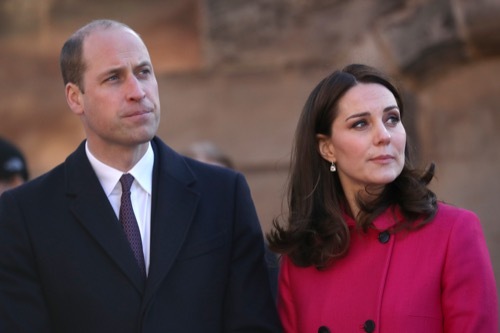 Prince William Admits To Cooking Rare Meat: Insensitive to Pregnant Kate Middleton’s Needs?